Our Easter trail has now finished but all 52 #BSQCalmerLlamas are on display at the New Room until tuesday 30 April. You may associate Easter with bunnies or chicks but in Bristol Shopping Quarter we like to do things differently. 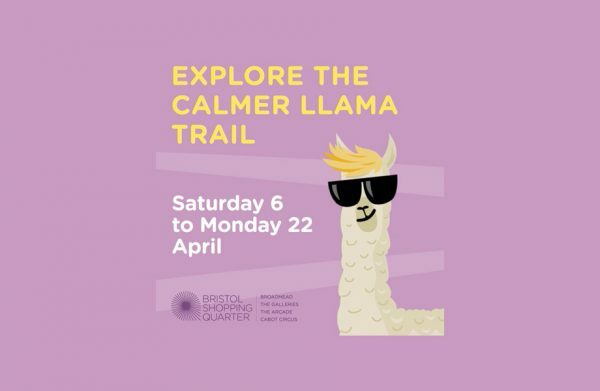 For the eighth year running the Broadmead BID team are working in partnership with The Ark Bus and The New Room/John Wesley’s Chapel to create a very special Easter trail, this time featuring 52 Calmer Llamas! Schools and youth groups across Bristol decorated the Calmer Llamas during March. They were distributed to retailers at the beginning of April and are on display in shops and cafes from Saturday 6 to Monday 22 April. Maps showing their locations will be available from The New Room in Broadmead, Specsavers on Merchant Street, Barber Brown on Bond Street, and from the information desk in Cabot Circus. The Ark Bus team will be running family craft activities on Tuesdays 9 and 16 April between 11am and 1pm. All welcome. Activities are free but donations welcome. They will also be hosting Matt’s ‘Drop in’ Mindfulness Meditation Sessions on Wednesday 10 April from 2pm – 4pm and Wednesday 17 April from 11am – 1pm. These sessions are suitable for beginners as well as for those with some meditation experience. Matt will teach various techniques to benefit our health and well-being. 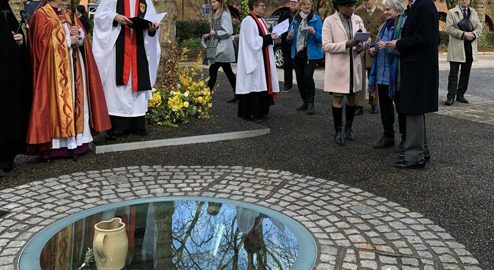 Matt Albury is the Bristol and South Gloucestershire Methodist Circuit Chaplain and an accredited and registered teacher with the British of School of Meditation. Additionally, The New Room will host a Calmer Llama celebration week from Tuesday 23 to Tuesday 30 April* when all the llamas will be displayed together. This year’s trail theme is Resilience and Determination’. The Ark Bus team felt this was a relevant topic to explore as we are living in a period of uncertainty and change, which can leave us all feeling discombobulated at times. All the groups were asked to consider the things in their lives they may have found difficult and how they have overcome them. They also remembered how it felt when they achieved something they first thought impossible or just too hard. Groups also considered how they could help other people who were facing difficulties – could we all make someone else’s life a little easier by being a good friend, or showing some kindness? The llamas are decorated with all these thoughts and feelings in mind! At Easter, the story is told about the journey that Jesus took which resulted in his death on a cross. For his friends and followers, it must have felt that all hope was gone. Yet new beginnings often come out of painful endings and ultimately Easter is a story of hope. Jesus died on Good Friday but three days later on Easter Sunday, his tomb was found empty and his friends met him, risen from the dead. They found hope, joy, forgiveness and a new start. We tell this story to remember that hope can be found in difficult times and that there are always options and possibilities to move forward. As you discover the llamas please record their names in the grid provided on the trail map. When you have found all the llamas (or as many as you are able), head back to John Wesley’s Chapel/The New Room to collect a small chocolate prize*. Have fun! *Please note the New Room is normally open 10am until 4pm Monday to Saturday. It is closed on Sundays and on Good Friday it will only be open until 1PM. 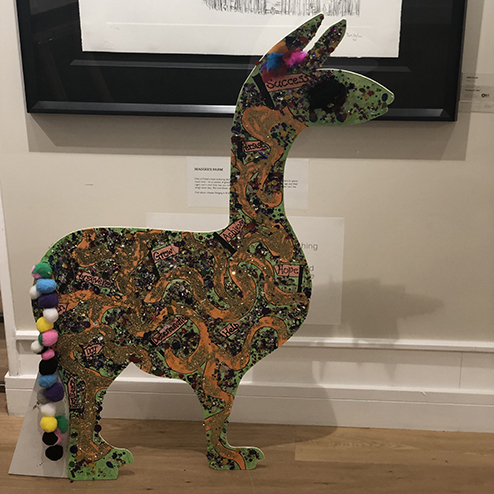 Llama 37, decorated by Parkwall Primary School is in a different location to that indicated on the trail map – he’s still in Quakers Friars though, having made his home for Easter at Castle Fine Arts. This year the material used for the llama shape has been altered to be more environmentally friendly. The children can use paint, fabric and collage materials to execute their designs and we are sure they will let their imaginations run wild! We will be posting our own photos of the event on our social media channels, just look for @bristolshopping on Facebook, Instagram, and Twitter. We’d love to see your photos too, use the hashtag #BSQCalmerLlamas and we’ll share our favourites. If you’d like to find out what’s happening in Bristol Shopping Quarter throughout the year please visit our news & events page.